Cutting the cord is a US thing, but there are some differences between us and the States, and cutting the cord has its downsides. US consumers have grown to hate their insect overlords, or should I say their cable companies, because unlike the UK, the bulk of TV is watched via cable or dish. Those companies generally have a local monopoly, often have high prices and like to bundle channels you dont watch (Sports for instance) with ones that you might. As a subscriber, you'll have to pay for these, even if you dont watch them. US websites showing how to do this tend to explain to people that they can still get programmes via an aerial (in a way which makes it sound like old lost knowledge - like growing and canning heritage variety veg) and using Apple TV, Chromecast etc to get services like Hula, etc. However, there are snags. Firstly, if your going down the streaming route, you'll need broadband. That often means carrying on paying the same rapacious huge corporation which was gouging you in the first place. And although thanks to the seeming victory of Net Neutrality in the US certain broadband providers cannot strange bandwidth unless they get a big 'fee' from the content provider, broadband can still be far too slow. Rural Iowa is not going to be lightening fast. In fact AOL (the Satan of ISP's) apparently still makes a decent living out of dialup customers in many rural areas of the States. And of course if you have severed links with large groups like Viacom, you then have to deal with the likes of Amazon, HBO (owned by Time Warner), Netflix, Hula (owned by NBC, etc), CBS, etc.Plus of course Google or Apple. All very cuddly and upstanding. Now in the US you can watch via a TV, or whatever you like, but here its a little different. 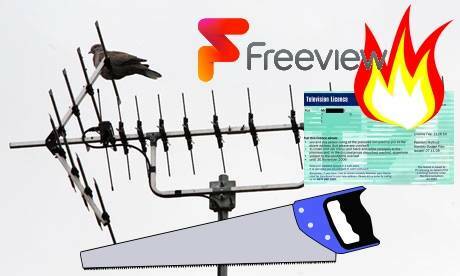 Firstly, you need a licence to watch a TV (unless it has no way of getting live transmissions). Since the bulk of people do have such a TV, then they are still going to have to pay anyway. So cutting the cord doesn't save you any actual cash, but does mean you can generally only watch an hour or more later than everyone else, find it more difficult to record, etc. And since we dont tend to have cable, we are not reverting back to aerials, etc - thats what the bulk of people in the UK already use. So OK, your watching ona PC, laptop etc. Whoopie Do. You are watching on a screen which at largest is generally 27-28in (although there are some 34in around). Thats a bedroom TV, and possibly about the samesize as the one your parents had in a CRT in 1999. Mostly they are 24in, which takes you back to the 1970's or 1980's. And if its a laptop screen, then its possibly the sixties or before. A Kindle? Think Logie Baird. When you want to watch England crash out of the next World Cup, do you want to watch it on a small screen or a large screen (48-50in is now the average main room size). And do you want to watch it live, or an hour or more after everyone else? Its going to be so much fun getting everyone round to watch the Strictly Final an hour later than everyone else and on a screen half the size that your friends have got. OK, so some services will allow you to watch live, but adding up the cost of that each month might be more expensive than you might think. And its true that 4K is only going to be streamed at present, but if your just buying a 4K for streaming, your viewing might be a bit narrow, and frankly, you've just splashed out on a new TV - the marginal cost of a licence might not be the prime consideration. And its depends what you watch. There is some talk that Netflix UK really doesn't have the sort of library that the US version does, and if your the sort of person who prefers Call the Midwife to Game of Thrones, then your going to be a bit disappointed. And if your bandwidth is low (and for much of the country its very slow), then all your going to get is a little swirly symbol in the middle of your screen. Every time there is an article about the BBC licence fee in the Guardian, the comments section is full of the normal bar room blather. There are also a number who say they never use the BBC (probably lying) or if they do, then they do it via their PC, etc and thus pay nothing. They tend to put this forward as some sort of libertarian 'sticking it to the man' type thing, but basically is because they are moochers, living off the rest of us. Its time to make Iplayer dependent on having a valid licence fee - it would be easy, it would quickly show up those who dont seem to ever watch the BBC, but yet just once or twice..., and would cut down hugely the number of freeloaders. As for cuts, lets start with Long Wave (not a lot of money, but it sends a message) and the five million a year that the BBC apparently has to pay the local TV companies for content (how about payment by results?). Again, a tiny amount, but it says that the BBC is not going to take any bull. BBC4? Thats going to hurt, and if it does, then the BBC can point out to every newspaper columnist in the land which loves BBC4 (pretty much all of them) that supporting the freeze in licence fee, etc has consequences. Local Radio? people are going to hate that. So in that case, dont write to the BBC, write to your local Tory MP. The BBC has less money, and they are one of the reasons why. Almost seventy percent of TV is still watch live - thats a habit, and its takes a long time to change habits. Even if the average 17 year old is streaming to their hearts content, they will want to watch must see TV on a big screen if they can, and certainly live if possible, and by the time they get to the pint of buying their own large TV, then they will still stream, but that wont be the only way they watch. Cutting the cord? You can if you want, but whether people actually get what they want or save money might be a more difficult question. You DON'T need a license simply for owning a TV capable of receiving live transmissions. That requirement stopped a long time ago, after all, how these days do you define "no way of getting live transmissions" anyway? A TV (or monitor) with no aerial and no digital decoder can still 'get live transmissions', as pointed out, with a cheap internet-tv dongle. Is a fully working new TV connected to a DVD player still considered capable if it's not got any aerial/cable/satellite/internet connection? I own 2 TVs, one BIGGGG, one LED projector, and one DLP. Lot's of big pictures all around, no TV license in sight! From: Official TV Licensing website - What if I only use a TV to watch videos/DVDs/as a monitor for my games console? Do I still need a licence? What if I only use a TV to watch videos/DVDs/as a monitor for my games console? Do I still need a licence? You do not need a TV Licence if you only use your TV to watch videos and DVDs or as a monitor for your games console. You can tell us that you do not need a TV Licence by using our online declaration form. One of our Enforcement Officers may visit you to confirm that you do not need a licence. Jamie: thanks for that. I was rather hoping to get several detailed articles on this topic. Your input is very valuable. For all the use I get from my Freesat+HD box I would also be one of the 4% but it seemed very unfair to have this site and not contribute to the BBC when it is the bulk of my non-US watching. Anyway I was trying to come up with a "checklist" so you can legally prove you can't watch live TV on them. "Drop in the number of licence fee payers leaves broadcaster with a £150m hole in its finances"
The new proposals are expected to save £50m largely by merging divisions and cutting layers of management. Senior management roles will be cut across the board. In some places there are currently 10 layers of people and this will be cut to a maximum of seven in all areas. In a release the BBC said: "A simpler organisation will inevitaby require few managers, especially at senior levels." Professional and support areas will be "simplified and procedures standardised", a move that will hit employees in marketing and communication, finance, HR, IT support and the legal department. Technology teams across digital, engineering and worldwide will be merged. Staff in these areas are to be told to expect further changes. The new measures being proposed are expected to save £50m from merging divisions, cutting down management layers and improving processes. Consultation with staff will start in earnest over the summer, with most of the jobs expected to go by the beginning of next year. Jamie: If your not using the BBC at all, then I've no great problem with not paying the licence fee. OK, so you used the BBC website once or twice, but thats not a hanging offence,. If your not using the service, then your not sponging! The ones I hate are those who comment on websites swearing that they never use the BBC in anyway shape or form, but you know they do (a bit like a supposed veggie lecturing you, when your pretty sure that they've just has a Big Mac). Personally, I think your missing out on a load of great stuff, but its your call. I am interested in what prompted you to change completely, and what you use to do so (Pocket Lint has a guide, and its interesting to see the differences between the services). Which service do you use, and am I guessing right that your watching tends to be films and US series like Game of Thrones etc? My brother could also be termed one of the 4%, and he has said that he doesn't really need a tuner in the new TV he just bought, since he pretty much streams everything. On the other hand, he is an IT professional, has 100mb fibre supply, and is an early adopter (I tend to get his castoffs!). One thought did occur to me. If you are streaming via Amazon, Netflix, Itunes, etc for mostly US shows, could it be said that you've cut the cord not so much from terrestial broadcasting (and not just the BBC), but to a large extent, Sky? Cord cutting is fine provided people stick to the rules. It is now being proposed that using 'catch-up' services such as iPlayer may in future be subject to license fee conditions. Frankly I think this is fair. People who say 'we never watch live tv' invariably seem to stray when there is a major sporting event, EastEnders or programmes their children want to watch. Obviously there is a lot of criticism, not without some justification, about wastage at the BBC. However in the end you are getting 6 tv channels most of them in HD often in a reception quality that exceeds on-line delivery or via Sky, a wide variety of national and local radio stations and a first class information base on the internet. All of this, for all your family, at 38p a day! You can't buy a quality newspaper for that. If a mass exodus from paying the licence fee occurs we may eventually only be left with subscription paying services and heavy advertising input such as you see in the USA. Your choice.